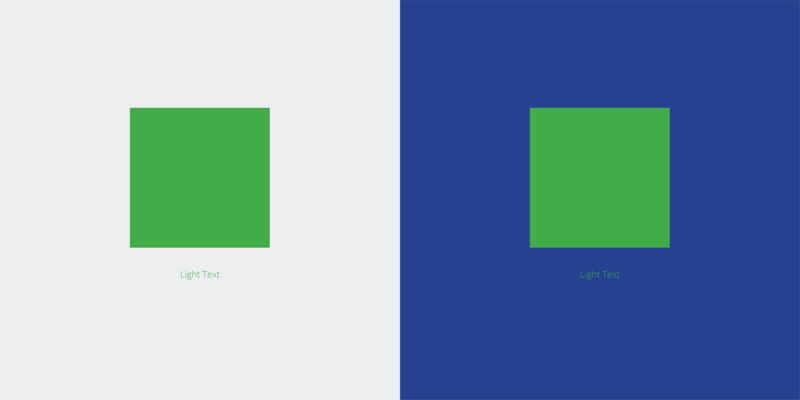 Considering that is a big blue square that contains another smaller green square and under the green one is a small and thin text with the same color of the green square. So, in theory, the text and the small square are the same color, but when putting under a blue background, the text will look like is having another shade of green. My question here is if you know any tip, rule or theory which can be applied to the text so it will have the same color as the green square? For example: Lightning the green of the text with 10% or something like that..
Browse other questions tagged color fonts background color-theory or ask your own question. What Color Theory goes into designing camouflage?